Former principal of Horseshoe Trails Elementary School, Matthew Schenk, was arrested Tuesday, March 11 on two counts of sexual assault and one count of sexual abuse. A report was filed May 2017 by Joshua Barry, an 18 year old male with the Peoria Police Department. According to Barry’s statement, Barry and Schenk met through their shared religious organization when a friend, currently unnamed, introduced them. Schenk advised teens who needed help and Barry struggled financially living out of his car. Schenk suggested that Barry move in with him. The alleged incidents occurred shortly after Barry moved into Schenk’s residence. Following the alleged incidents, Barry moved into another friend’s residence and went to the police. Barry additionally mentions he had since spoken to the friend who introduced him to Schenk. The friend had a similar occurrence happen in Mexico with Schenk on vacation in 2016. The unnamed alleged victim did not report this incident to the Police Department. Graham attempted making contact with Schenk at his residence twice and finally reached him by telephone on October 23, 2018. Schenk stated that he knew of the allegations to which Graham referred and that the allegations were false. He said he had acquired legal council and that they would be contacting Graham to schedule an interview. Schenk’s attorney, David Le Lievre, contacted Graham November 19, 2018, but said he needed to talk to Schenk before scheduling an interview. By December 26, 2018, Graham had heard from neither party regarding an interview. “After our detective gave Schenk several opportunities to tell his side of the story, he decided to submit the case to the County Attorney’s office for review and possible charges,” said Brandon Sheffert, a media relations officer at Peoria Police Department. In February 2019, the case went to the Grand Jury. Later in February, Schenk announced he was resigning his position as Horseshoe Trails Elementary School principal in favor of a similar position at Sias University in China. The Grand Jury issued their decision to continue with charges. According to Sheffert, Schenk was arrested trying to leave the country on March 11, 2019 at the Los Angeles Airport and extradited back to Arizona to stand trial. He was checked into the Fourth Avenue Maricopa County Jail in Phoenix, Arizona. The District was contacted by the Maricopa County Sheriff’s Office on March 11, 2019. At that time, the authorities sought information regarding the whereabouts of Dr. Matthew Schenk. The detectives instructed the District that the matter was the subject of a Grand Jury indictment and that the District could not disclose any further information at that time. The District did not learn of Dr. Schenk’s arrest until yesterday evening. The District administration has spoken with law enforcement and understands that the allegations of criminal activity concern a twenty year old male victim. The allegations center around contact in May 2017; the District was not aware of any criminal investigation until March 11, 2019. According to court records, during the arraignment held on March 28, Schenk plead not guilty. 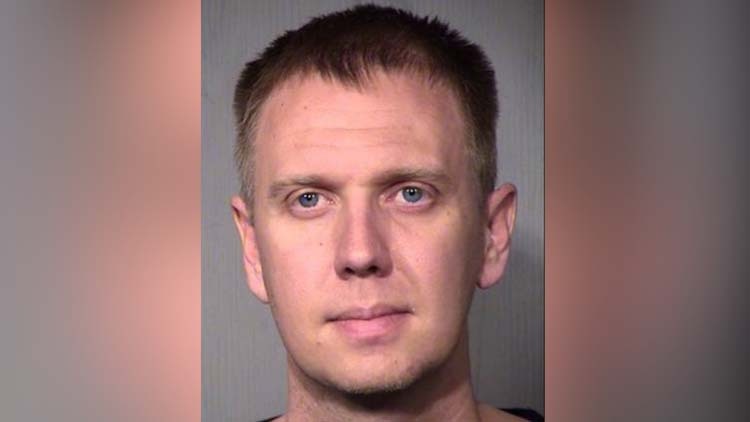 Schenk posted bond, set at $100,000 on March 28, 2019 and Maricopa County Jail released him under electronic monitoring. He was ordered to submit DNA testing within five days of his release date. Schenk has changed his attorney and is now represented by Michael Leal. The audio recordings will be submitted in the Initial Pretrial Conference on May 9, 2019. This will be followed by a Comprehensive Pretrial Conference on June 10, 2019. Maja Peirce – student journalist at Cactus Shadows High School.